I was deeply skeptical when the Bourne movies were released. 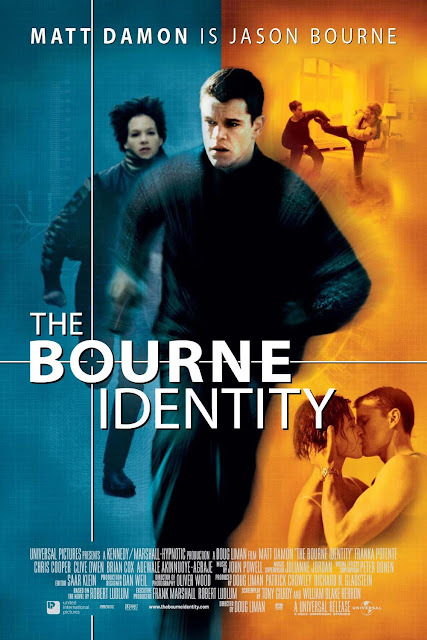 I don't know exactly why, but I used to find non-Bond espionage stuff a bit boring and I was a bit suspicious of Hollywood forcing Matt Damon on us all. But when the third one came out and everyone liked the first two, I borrowed some DVD's from a trusted source. Fortunately, the Bourne movies wound up making a believer of me. Not only am I big fan of these films, but I finally came to accept that Matt Damon is one of my favorite actors working today (you guys saw The Martian, right?). I really don't think I need to sell a huge blockbuster that spawned four sequels (one, inexplicably, starring Jeremy Renner, and, no, I didn't see it, either). Likely you've all seen the movie, so I don't feel a particular need to say much about it. It seems to me that the movie brought a few things to the big screen. It's been years since I watched After the Thin Man (1936), which is kind of funny, because I have the poster for the movie hanging on the wall of my house. I'd also gotten some of the details of the movie criss-crossed with other Thin Man films as I'd watched most of them in a blitz several years ago, and hadn't watched any of them but the first one again in a while. I'm currently reading Return of the Thin Man, which is a fairly recent release as far as Hammett writings go. 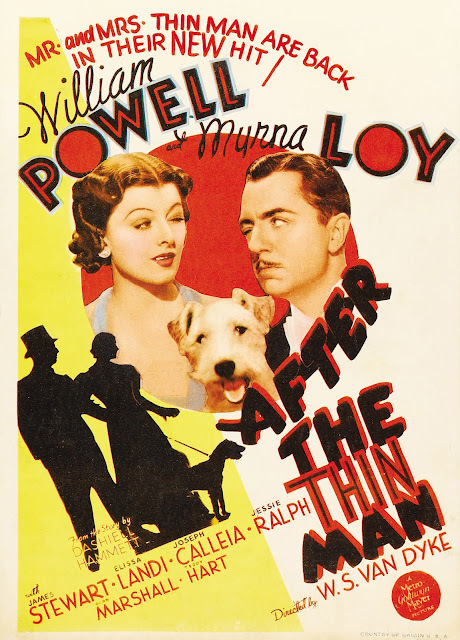 It's not a book or short story, but the film treatment he worked on for the second and third Thin Man films, along with historical material for context. While I remembered parts of the movie, most of what was in the treatment jived with what I could recall from the movie, so I was curious to see what was different. Here to my folks on their 48th wedding anniversary. Like all great romances, my folks met in a bar in a small town near the Air Force Base where my dad was stationed and in the vicinity of where my mom was born, living and getting her degree. 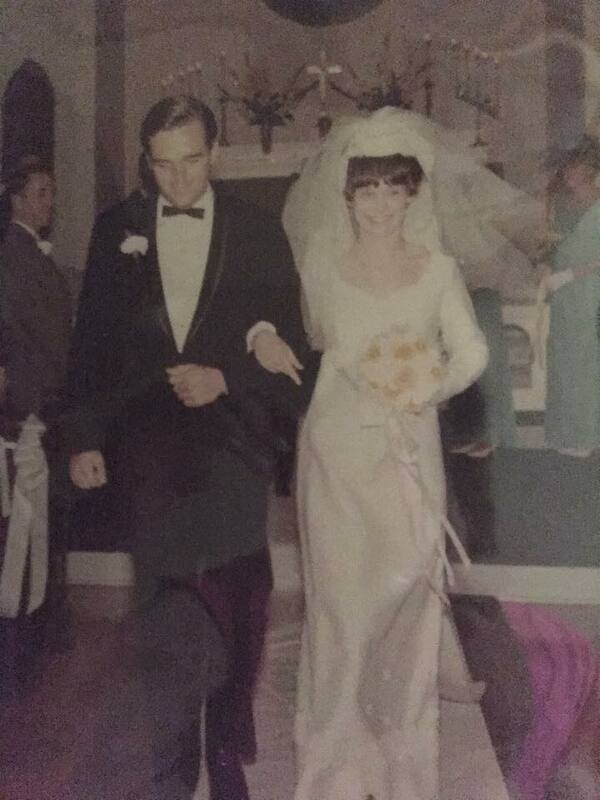 This is their wedding in the church where my mom grew up, up in Negaunee, Michigan. Over the years, they've really made it work in good times and tough times. That's no small feat, especially when you consider - on paper - how different my parents were when they met. Of course, 48 years together has knocked off some of those edges, and they've figured out the whole compatibility thing pretty well. In fact, since retirement, they're more two peas in a pod than ever before. Marriage is work, and it's okay if it doesn't work out. Not all projects keep going. But I cannot imagine these two any other way than still arm in arm, making their way together. They've certainly been able to keep themselves a working, cohesive unit. You're supposed to say that watching them has given you a model for marriage, and that may be true. It's been internalized lessons, and I've done it differently, no doubt. But I think I am aware, more than anything, that the secret for them was likely open and honest communication, and it's something I strive for. And, of course, trying to have fun together. Love you, Mom and Dad. Here's to you. Sometime in the long, long ago I read the Warren Ellis/ Cully Hamner comic, Red. I've lukewarm on Ellis, feel he's pretty good but feel like he's a guy who always thinks he's smarter than he actually is and writes better than he actually does, and I think his ability to form an online cult in the 00's made him lazy. Hamner, however, I think is one of the finest comics artists of his generation, so he's got that going for him, and it really made Red a better comic than it had a right to be. I probably wouldn't have bothered with the movie, but it featured Helen Mirren in classy vixen mode with machineguns, and I don't know why you say no to a movie with that combination. It doesn't have that much to do with the comic, which is pretty thin. 3-issues of pure action, if I recall. Not much character development. But the movie expands on all this, inventing a whole cast, gags, etc... really not losing anything, but building a full 1.5 hours of movie on a skeleton frame. 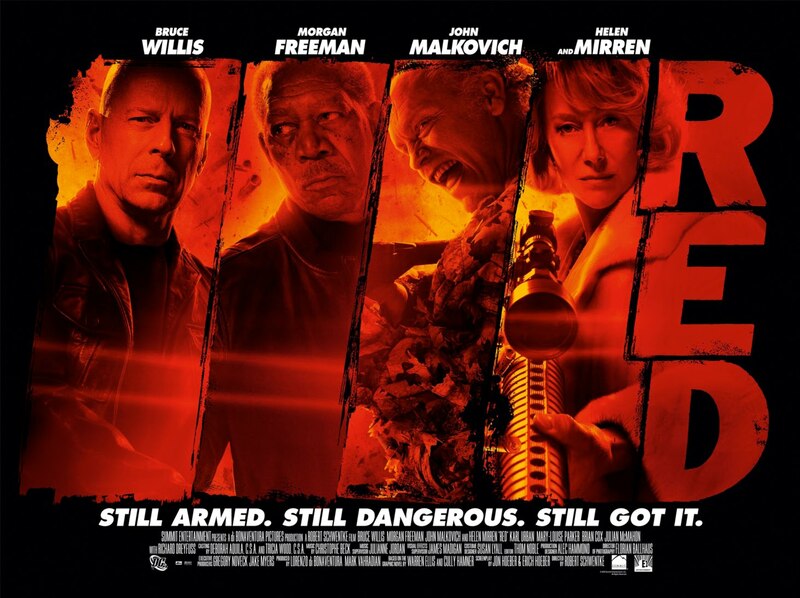 The movie stars Bruce Willis as a retired CIA assassin who is targeted by the CIA and has to retaliate. His HR rep (Mary Louise Parker) gets involved, and he goes about recruiting his old network to help him figure out what's going on/ get some help/ keep folks like him from getting whacked. 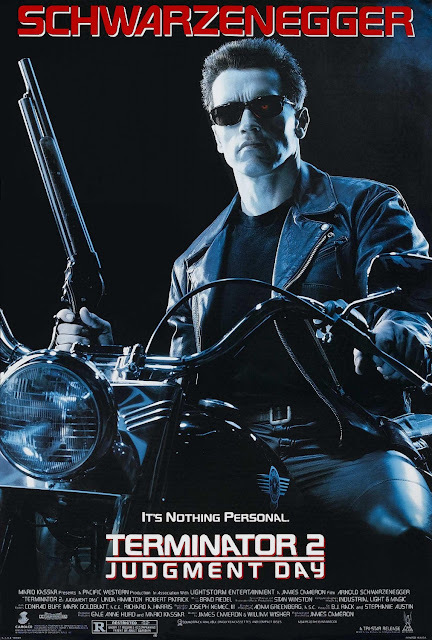 The film is a chance for actors to get together and play action hero - something The Expendables turned into a franchise overnight, only to burn through that fuel a bit too fast. The difference here being - aside from Willis - I really don't think of Freeman, Malkovich or Mirren as action stars in any era. But that's part of the gag as the movie trots out assassins that look more like average people than, say, Dolph Lundgren. But it also follows the pattern of the older, more experienced folks having to show these kids running things now how things are done. And, you know, there's a place for movies that pull that trick, and I don't mind. Especially as I realize I'm now well past the 18-35 year old demographic. The movie doesn't have much new to offer plotwise or tricks wise, and it's mostly relying on the charm of the actors they've assembled. Which, you know, when you've got these folks, Brian Cox as a former foe, Richard Dreyfus in a key but small role and Ernest Borgnine showing up in a walk-on, mission accomplished. Really, it feels weird that I didn't watch this with The Admiral. Maybe one day. 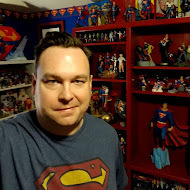 It's no secret I wasn't a fan of much in the way of Superman comics since the launch of The New 52. Somehow the character stumbled off the blocks, introduced in Justice League #1 as a showboat and almost a bully. 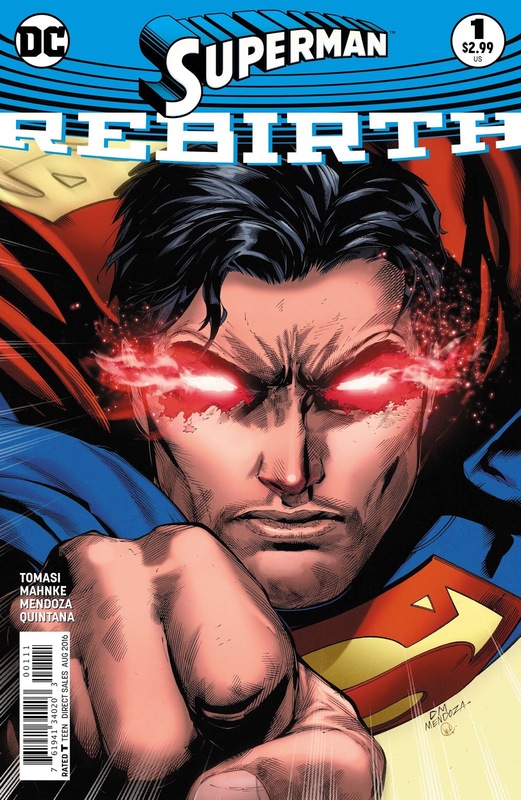 The history of the character never added up, what with DC's mishandled "we're five years in since Superman appeared" idea, a history they utterly failed to reconcile with pre-Flashpoint continuity despite their promises to the contrary. The Superman title tried at the start. You could feel George Perez try, get compromised again and again, and his abrupt departure and comments afterward about editorial interference jived with the inconsistency of what was on the page, not just in that title, but in many of the New 52 titles I tried out. 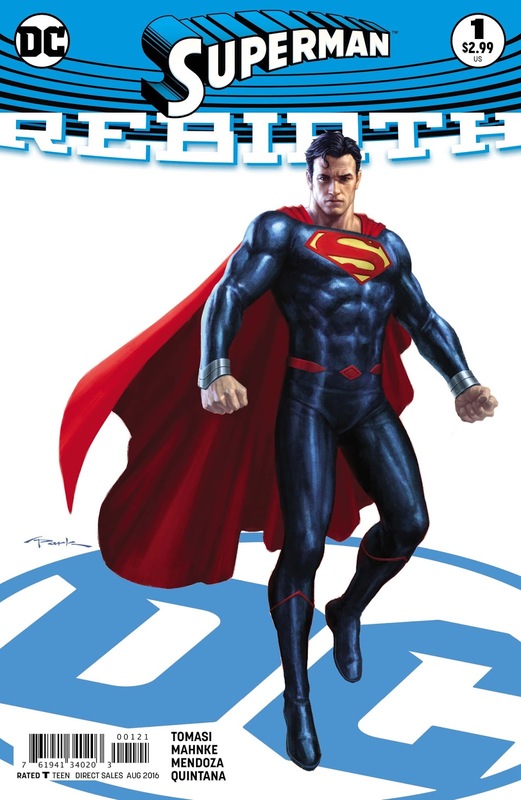 Over in Action Comics, Grant Morrison was given free reign to do as he pleased, and you could feel him trying to do something, working hard to try to seize the opportunity, but whatever he was trying to build with a blue-collar, working-man's hero in jeans and t-shirt was mis-appropriated to ill-effect by the end of the New 52 era and "Street Fighter" Superman in jeans and t-shirt almost a loud sigh that DC just didn't know what to do with the character they'd tried to assemble. The comics just never quite worked. I wish they had. I can't say how much my waning interest in Superman comics took out my interest in comics in general. If you've seen a major shift from comics to movies in my blogging - well, where do you suppose I'm spending my dollars and spare hours now? But all that aside - as Superman readers, what did we actually get out of Rebirth? Well, man, they've certainly got their work cut out for them. It had been some time since I'd watched the 1973 sci-fi classic, Westworld. I'd rented it with Jason some time back in the late 80's, and I think we both really liked it (but, if memory serves, he'd seen it before). I've only seen it again once in college somewhere along the line, enjoyed it, but not watched it again anytime in the last 16 years at least. I've tried to watch the sequel, Futureworld, but just couldn't watch the 1976 film. Something about the pacing lost me the one time I tried to give it a whirl. 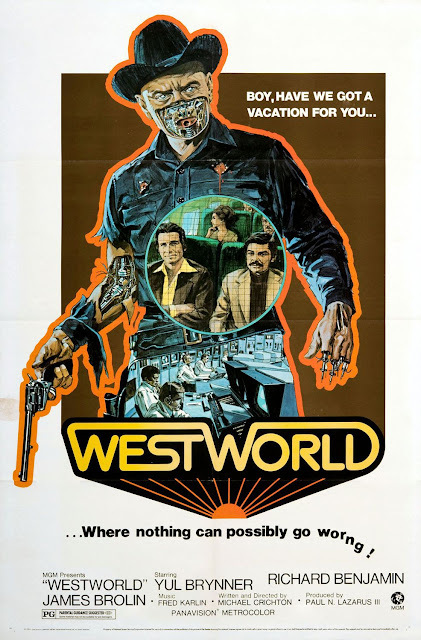 It seems HBO is launching a TV series also titled Westworld which will greatly expand on the ideas presented in the movie. It's got an all-star cast and looks to be the sort of thing I find interesting in science fiction. * I'll be checking it out, certainly, and have high hopes. Anyway, it got me fired up to review the original film once again. Normally this sort of thing isn't my bag, but a while back my pal SimonUK gave me a print copy of this book, and I picked it up and started reading it only to hear Michael Caine's voice reading the book in my head. "Well," I reasoned to myself, "why not see if he actually did an audio recording of the book." And, indeed, he had. I don't know much about Michael Caine and I'm not up on his filmography. 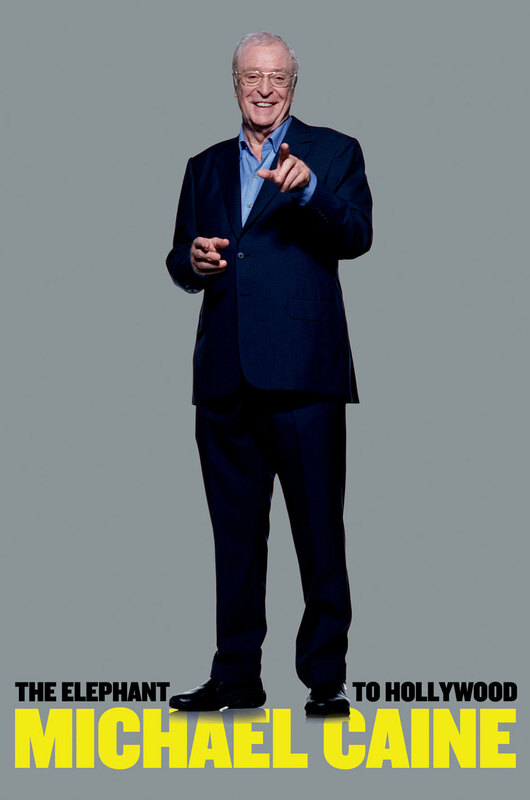 But, you know, who doesn't like Michael Caine? This was actually his second memoir, and I suspect the first one probably played up a bit more of his exploits and wild, free-wheeling ways in the 60's and 70's. But this one is more or less Caine's reflections on being a bit of a lad from an area of London called The Elephant and Castle, a down and out neighborhood both during his youth and at the time of the book's writing (circa 2010). He grew up working class, a father serving the army in WWII, and Caine himself evacuated. Post-war, he grows up a bit tough, decides on theater and acting as a career, and as a young man pursues the idea with dogged determination, even as misfortune and the challenges of life heap up.